This set is very nice. Well made and the counter is sturdy and a high quality. Delivered in two pieces (the base and the counter). Both are very well packaged and items arrived up my mountain dirt road without any damage. The Caroline collection has a beautiful, clean design that will rejuvenate any bathroom. It is constructed from a high-quality zero-emissions solid oak wood, finished in a modern grey finish and equipped with state-of-the-art soft-closing door and drawer technology. Take notice in the beautiful 1-inch countertop edge thickness Italian Carrara white Marble that's sheer size alone guarantees that it will outlast the rest.Virtu USA has taken the initiative by changing the vanity industry and adding soft closing doors and drawers to their entire product line. The premium soft-closing hardware not only increases the safety of the vanity, but also its lifetime reliability. The Carrera marble surface and Undermount sinks look expensive, soft closing drawers and cabinet doors give a high-end feel, all painted white insides finish the luxurious presentation. Hardware is shiny and modern, may change that out to something more vintage. 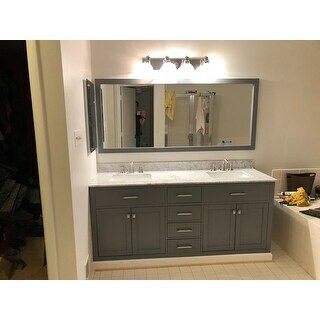 Dark gray paint is gorgeous as well as the huge high quality mirror. EXCELLENT value for the price! This vanity looks great in our main bath! The grey matches perfectly with the accents in our floor tile. The hardware on the vanity is somewhere between chrome and satin nickle as certain parts are actually shiny. 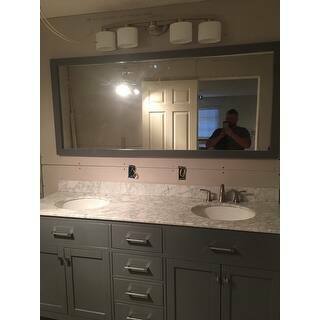 Has 3 hole widespead faucet holes, and fit the 72" space for the vanity we had picked it out for perfectly! The drawers and cabinets open and close very softly which is great - no more slamming! 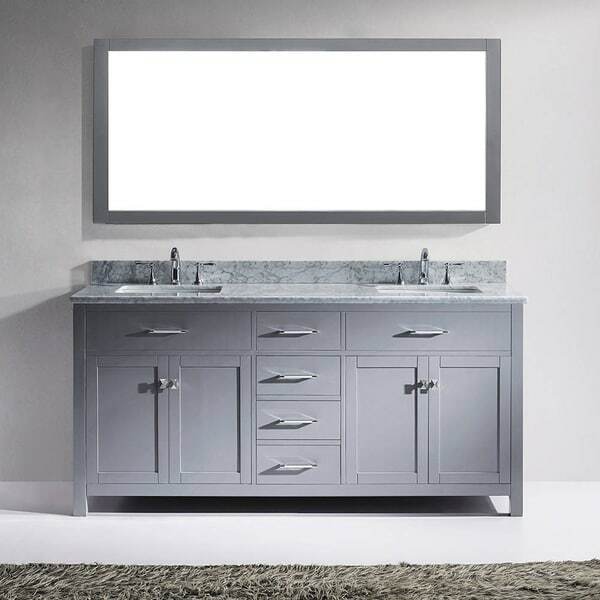 This is a great vanity- a great grey color, soft close drawers and doors, and the mirror is a huge plus! Downside is, it doesn’t come with a side splash for where the counter meets the side wall- and no mention on anything of where one can be ordered. It is a great value! Our contractor had to make a different bottom for it since our tile didn’t run under the old vanity. Turned out great! I didn't have the best experience as it arrived damaged all the way. There is a crack in the vanity, chips and scratches on me mirror and back splash. However Overstock replaced the item and its all good now. The vanity is very nice looking, i get complements all the time. Beautifully constructed. Very happy with the purchase! Beware that this vanity has a laquered look to it, in my opinion, making it look cheap. "Are the faucet holes pre-drilled? I already have the faucets I need to know if it will fit. Also what are the finish of the hardware chrome or nickel?" "Hi, does it come with the marble top and sinks attached, or separate and we have to attach them?" Shelves are built in. Cannot be moved.